profiled grinding wheels for Weinig, Diehl, Foley, Jeffers, Nielson, Wadkin, and Schneesberger profile grinders. Aluminum Oxide is made by fusing bauxite, a soft earthlike mineral, in an arc type electric furnace and then allowing it to cool and crystallize. This is made at temperatures ranging up to 6000 degrees Fahrenheit, which causes all impurities be burned, leaving practically pure alumina. Since alumina is the cutting unit of any abrasive, it is obvious why this is superior to the natural abrasive emery. Aluminum Oxide is made in various grades and can be used in varying combinations suitable for the type of grinding being done. Ceramic abrasive is an inorganic, non-metallic material that is brittle, hard, and strong under compression. 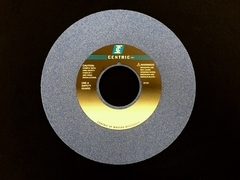 Centric Inc. ceramic profile grinding wheel technology is on the leading edge of the woodworking industry. What makes ceramic profile grinding wheels perform above other aluminum oxide wheels is the ceramic abrasive grain will break from the bonding, exposing a new sharper grinding surface. Ceramic as an abrasive is suitable for fast cutting on almost all materials, including stainless steel, mild steel and aerospace alloys. Grit determines the abrasive grade of the profile grinding wheel. Grit is measured by grain numbers. The grain number applied to grinding wheels indicated the size of the grains used in the wheel. Grain number is determined by the number of meshes per lineal inch in the sieve through which the grains are passed in the grading process (see image below). A wheel of number 46 grain is composed of grains the largest of which will just pass through a sieve having 46 meshes to the inch, and the smallest of which are too large to pass through the next smallest size, number 54. The grain of wheels commonly employed on Centric profiled grinding wheels falls within the limits of 46 to 100. The bond is the binding material which holds all of the abrasive particles in place; it should be of such strength as to release the dulled grains only after each grain has done its work in a fast, cool cutting manner. The strength and kind of bond that should be used depends on the type of material to be ground. If you are profile grinding on a Weinig, Diehl, Foley, Jeffers, Nielson, Wadkin, or Schneesberger profile grinder Centric Inc. has a profile grinding wheel to fit your machine. Profile grinding can be a difficult and tedious process and choosing the right equipment for the job can be confusing. The tooling specialists at Centric Inc. can provide you with expert information and recommendations on the best tooling and consumables that will best serve your manufacturing needs.